Post #2: Choose a sketch from one of the PTI design team and make a card. Surprise, surprise, I was immediately drawn to Betsy Veldman’s sketch. 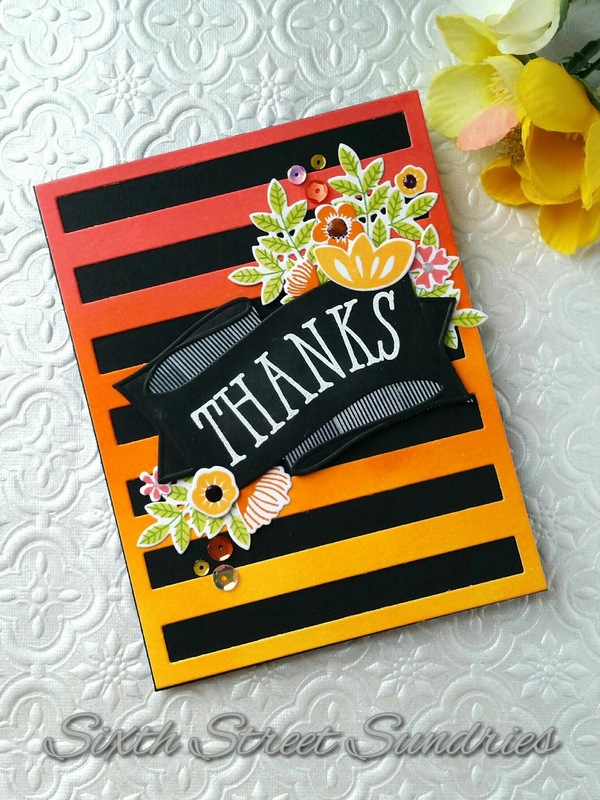 There is something about horizontal stripes and flowers. I originally intended to go in a Christmas direction with this sketch, but I didn’t end up liking it. So, I came up with this ombré, sunset, practically neon card instead. One of the best things about SAF is that I challenge myself to use stamps that don’t see much love from me, but from which I also loathe to part. This card focuses on Embellished Elegance. 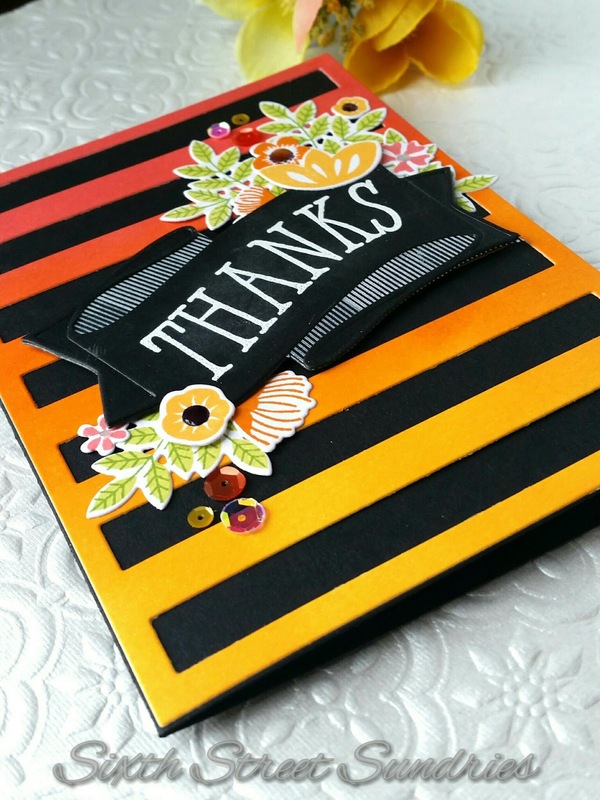 I first used Berry Sorbet, Orange Zest, and Summer Sunrise with my ink blending tool to create the ombré background, which I then cut out with my striped cover plate. 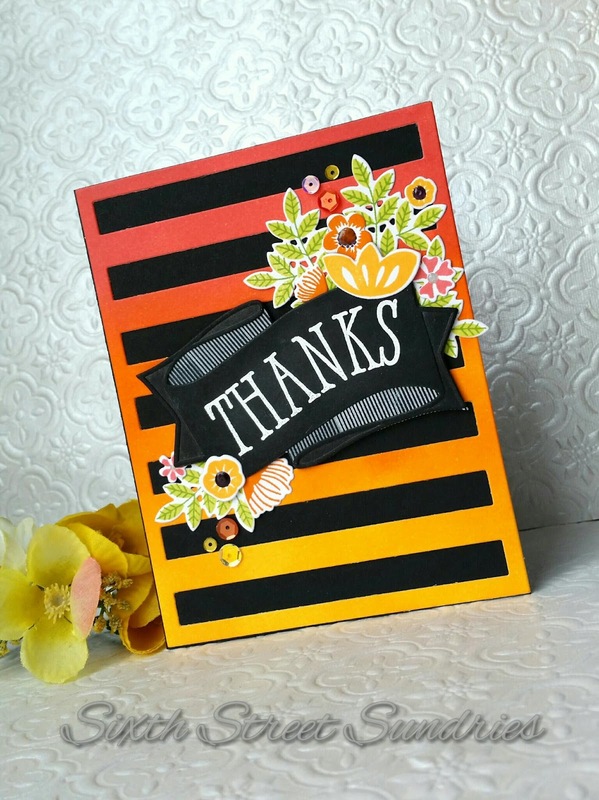 I popped up the Layered Banner Banter stamps and dies with foam tape (another darling set that doesn’t see enough love at my stamp desk) to create the greeting, then added flowers from Embellished Elegance that had been stamped with Berry Sorbet, Orange Zest, Summer Sunrise, Limeade Ice, and New Leaf to the corners. Some sequins added just a little sparkle. I just love the super bright colors. They pop so hard against that black background.